Our congregation strives to maintain a robust calendar of events that includes something for everyone! Our goal is to engage in fellowship with both our congregation and the community. To accomplish this, we offer many opportunities for social and spiritual growth. Scroll down for more Annual Outreach Events & Activities. We would love to have you come visit anytime. We have several events here at Concord Road that are specifically designed to invite our neighbors in the community to get to know us here. This “ice-breaker” series is designed to “break the ice” with our friends and neighbors about Christ with events held throughout the year. Below is a listing of these events. If you’re a member of our community we hope to see you there! If you are a member, we look forward to getting you involved with these extremely fun and popular events!! Come out and join us at Vacation Bible School this year! There will be lots of fun for people of all backgrounds and ages. Activities will include Bible Stories, recreation times, crafts, devotions, fun skits, live puppet shows, refreshments, singing, our VBS mascot, elaborate decorations to match our theme, and much, much more! Santa Claus is coming to town! Mark your calendars for our annual "Breakfast with Santa" event! You’re invited to come meet Santa and get your picture taken with him! 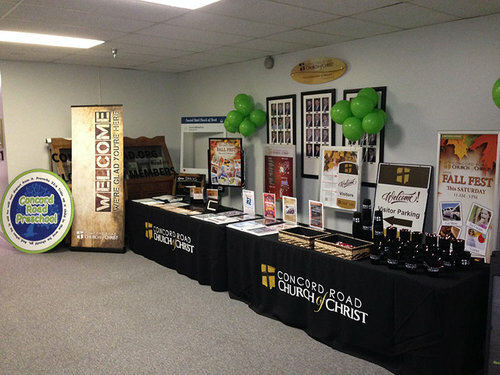 In addition to lots of festive fun, we’ll also enjoy a light breakfast, provided by Concord Road Church of Christ. There will also be a story read by Santa beginning as we kick off the holiday season! Another favorite annual event here at Concord Road is our Fall fest event where we celebrate the end of summer and the beginning of fall with loads of fun for all ages. Admission is free and events include a balloon artist, inflatables, ice cream, a car show, face painting, live bluegrass music, games and even a barbecue lunch. 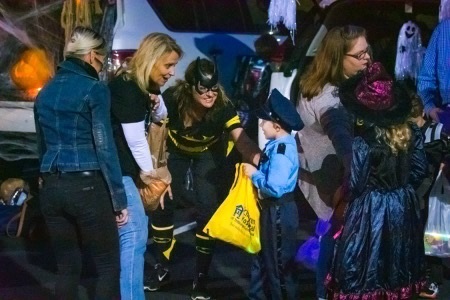 "Trunk or Treat" is a Halloween event that is extremely popular. Both members and visitors gather and park their cars in a large parking lot. They open their trunks, or the backs of their vehicles, and decorate them. Then they pass out candy from their trunks. The event provides a safe family environment for trick-or-treaters. Mark your calendars for our 25 Hours of Prayer event each Fall! Taking advantage of the additional hour we gain by "falling back”, we will have a 25 hour prayer marathon as we ask the Lord to bless our recent renovations, the Education Center expansion, and the dozens of ministries and programs that will benefit from these building efforts. Additionally, during this prayer marathon we would like to raise in prayer all of our current ministries, missionaries, sick, shut-ins, teachers, new members, mission trips, elders, deacons, preschool, our youth and a host of other reasons to offer up our prayers. The purpose of our ‘Ministry Fair” is to help us all find our place in the body of Christ to serve. Every Deacon and ministry leader will do an outstanding display set up in an informative, creative and fun way to communicate to each member what their specific ministry does and how YOU can get involved.